History and presence of the University of Al - Azhar - University of Al-Azhar is one of the main centers of education Arabic literature and Sunni Islamic studies in the world and is the second oldest university degree providers in the world. 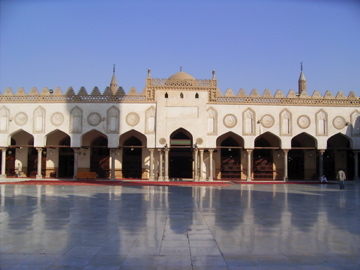 The university is associated with Al-Azhar mosque in Old Cairo region. The university originally built by Bani Fatimid Ismaili Shiite sect that embraces, and the designation of Al-Azhar take on the name of Lady Fatimah, the daughter of the Prophet Muhammad. The mosque was built around the year 970 ~ 972. Lessons begin at Al-Azhar in Ramadan in October 975, when the chairman of the Supreme Court of Abul Hasan Ali ibn al-Nu'man start teaching from the book "Al-Overview" on the topic of Shiite jurisprudence. Madrasah, where religious education, which is connected with the mosque was built in 988. Later, it was a school for Sunnis ahead of the mid-century, well-maintained and kept up to date. Currently, the mission of the university among others, is the spread of Islamic religion and culture. For this purpose, Islamic scholars (ulama) issued edicts (fatwa) to address various problems that asked of them from around the world of Sunni Islam, the behavior of individuals or the Muslim community the right (for example, recently was fatwa regarding clarification and and prohibition against female genital mutilation). Al-Azhar also trains pedakwah appointed by the Egyptian government. Library of Al-Azhar is considered the number two paramount importance in Egypt after the Egyptian National Library and Archives. Al-Azhar in partnership with ITEP, an information technology company Dubai, in May 2005 launched a project HE Sheikh Mohammed bin Rashid Al Maktoum to Preserve and Publish Manuscript of Al-Azhar Online ("Al-Azhar Online Project"); with a mission to provide online access to the public over the entire collection of rare manuscripts (consisting of about seven million pages) owned Al-Azhar library.